Gotta love it when the seemingly innocuous cards are the ones that attract the most attention. Or the ones that look “bad”! This is one of those cards that is better than it looks. The value of Stitcher’s Supplier is in its trigger (because a 1/1 for B is not a good deal anymore): mill 3 on its way in and on its way out. Self-mill is a sneakily effective strategy especially paired with other effects. Delve and dredge like cards in graveyards, and flashback and aftermath trigger out of graveyards for more shenanigans. This is slightly more efficient than Thought Scour; while not instant-speed, it is potentially 6 cards for 1 mana. This is not a flashy card, but I suspect this will show up a good bit as long as a format has a graveyard-based deck. The body is not promising, but a 1/1 can swing in efficiently when they’d rather it not die! All in all, this might be one of the more intriguing cards in Magic 2019, and I expect it to get played a fair bit. This card would not have been even slightly out of place in Innistrad, the block that popularized self-mill-themed decks in Magic’s modern era. 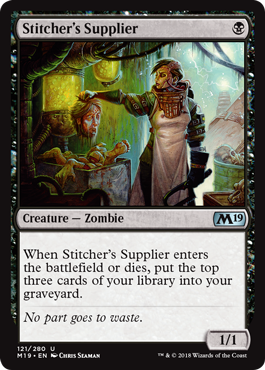 The strategy has existed before, famously with the Kamigawa block’s Ire of Kaminari archetype and then the dredge mechanic from Ravnica: City of Guilds, but Stitcher’s Supplier is notable because it’s so universal. It’s the perfect turn-one play for any deck looking to cast Stitched Drakes, it’s a cheap power-up for spells with delve and a permanent boost to Lord of Extinction or Mortivore, it’s an intriguing helper for casual threshold-themed decks, it might occasionally put three Narcomoebas into play at once, and it’s a cheap creature that can help you pay for Dread Return’s flashback cost. Ridiculous!